Apple has just dropped its latest stats on iOS devices, and it had some impressive numbers to brag about. 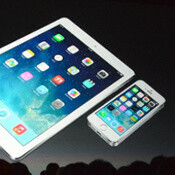 Apple has now sold a total of more than 800 million iOS devices. The iPhone is leading the way with a whopping more than half a billion (500 million) units sold. Just in the last year, Apple increased its iOS user base by 130 million users. The iPad is the second best-selling iOS device with 200 million units sold, and then the iPod touch has over 100 million units. Apple did not pass the chance to throw a punch in the direction of Google’s Android operating system, of course. "Nearly half of our customers in China switched from Android to iPhone," Tim Cook started what became a long tirade against Android. Cook shared satisfaction ratings of 97% for the iPhone, but not just that - the Apple CEO bragged about quick and widespread adoption of the current iOS 7. In fact, nearly 9 out of 10 people users run the latest version (in strike contrast to Android, Cook noticed). True or not, Apple is now taking a very clear, aggressive stance towards Android. What do you think, is its criticism deserved or not? iMessage is lookin even sweeter. Don't give a sh*t about the keyboard haha. Voice memos and videos and all that fun built in it nice. especially pick up and put down. Not to mention using my Mac as an actually phone when receiving SMS and phone calls form my iPhone. The nerve of Tim Cook not mentioning that iPhone sales declined by 85% in Japan for Q1 2014. The iPhones biggest market outside of the US. Also there was no mention of the 1.5 billion Android phones already sold. Yet more than 50% of people using smartphones in ASIA switched from Android to iOS…. 85% decline is irrelevant. Tsk tsk Android. Oh god, could you be any more stupid? What they actually said was that 50 percent of the people who bought iPhones in China were former Android users. Not fifty percent of overall smartphone users switching to iPhones. God, I try and I try, and you keep punishing me. Why? Last time I checked, "Hangout" was a flopping breathless fish on a boardwalk. He has some nerve....I wonder what happened to those bricked mac users in Australia and the world. Then he brags about 99% malware on Android. Did they even fix it? Exactly... The malware card is almost as bad as Scroogled....misinformation and FUD. Bad Apple....bad Apple. Thought you guys were better than that. What am I saying...this is Apple we talking about. and I'm one of these who switched and felt the helluva difference. The first time I experience android and ios was when my dad bought himself an ipad 2 and bought me a galaxy tab at the same time. When I used the ipad I feel like.. Why can't I do this? Why can't I do that? Why do I have to pay for something that I should be getting for free? Why this thing is so under-speced for a price that high? Even my dad regretted so much that he bought an ipad After that, I have ABSOLUTELY ZERO INTEREST IN APPLE PRODUCT. You sound like the people on 2am infomercials who are told what to say into the camera to make their product look better lmao. 18 people who green thumbed you probably bought magic hair growing cream once in their life. We are more than 18 who thumbs up. Me too! My last iPhone was the 4s and I will never go back. Android for me. I had the iPhone 2g for less than a week (no video shooting, itunes, and no Bluetooth sharing was main reasons for ditching it), then I gave the 3GS a try and that was it. I am stuck with Android forever, every year all Apple does is introduce new iOS features that has been there on Android for years. God bless you that hope you never will. Envy. I can feel it. Pure envy. Like how Jobs always talked about Android, you tend to focus on what bothers you the most. Exactly. Well said, my friend. So I guess that is why so many people here talk about Apple, right? No matter which device an article is about, people always compare the device to an Apple device. Not so sure about comparing their devices to iPhones, but PA does post enough of those stories. I think it's more of a seeded hatred that comes from one group looking down their nose at the other group. It's reversed a bit but the early days of Android were full of negative comments from iFans. Some people haven't moved on, from either side. I'm certain you feel envy. Um...no? Android users have had all of these features for years. I don't think you know what the word "envy" means. Ask SIRI for help before using a word you do not understand next time, lest you look foolish.